The Ultimate Fighting Championship will be returning to Toronto for UFC 231 on Dec. 8 at Scotiabank Arena. 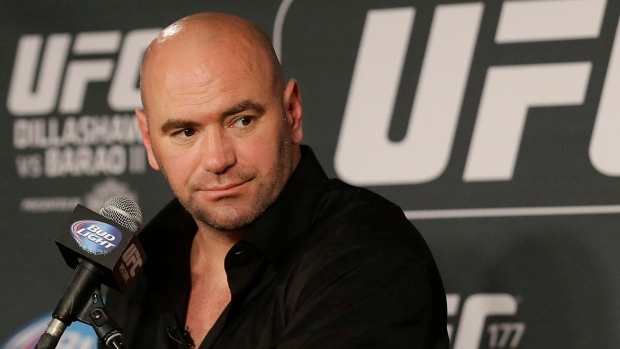 UFC president Dana White confirmed the news on SportsCentre. The event will be the third Canadian event of 2018, following upcoming cards in Calgary on July 28 and Moncton on Oct. 27 and it will be the final Canadian card of the year. UFC 231 will be one of the promotion's 13th marquee, numbered events of the year. This will be the UFC’s sixth visit to Toronto and the promotion’s 28th Canadian event. Headliners are not known at this time. The UFC last visited Toronto on Dec. 10, 2016, for a card that delivered some of the best fights of the year, including Cub Swanson’s decision win over Dooho Choi, a fight-of-the-year candidate. In his interview, White lauded the city of Toronto as one of the great combat sports cities, citing the historic visit during the Floyd Mayweather vs. Conor McGregor world press tour. White was the driving force behind the tour visiting the city, a packed event that took place at Budweiser Stage and considered by many to be far and away the best stop on the tour. UFC 129, the first event that was held in Toronto at the Rogers Centre, still holds the promotion’s North American attendance record.